What do a baton twirler, an ex-rodeo rider, and an actress have in common? They are just three of the many women whose lives are explored through their relationships to work, other women, parents, men, and the socio-political environment. Talking With is a summation of thoughts, events, actions, memories, hope, defeats, and dreams dramatizing the challenges that all of us face in contemporary society. Characters confront the audience directly with revelations that are not simply truthful, but deeply spiritual, hauntingly private, funny, and frighteningly exotic. 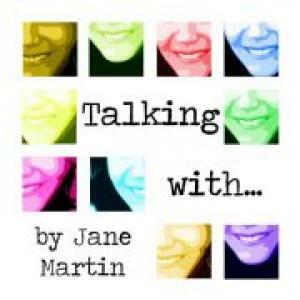 Jane Martin's "Talking with⁬..." presents twelve females with twelve divergent points of view, each of whom is given ten minutes or so alone onstage to explain herself to the audience. This is both the strength and weakness of the show: if a viewpoint becomes tangible in an actress's hands, it's magic; if the character's worldview doesn't connect in some way with an audience member, it's ten minutes wasted. Luckily, there was little waste of time for this playgoer. The starting playlets of each act were the least engaging to me. "15 Minutes" mused on the idea of an actress wanting the audience to provide bios to the actors; "Lamps" played with the idea of light shaping the world. Both were well-acted, but the material didn't particularly engage me. The ending playlets of each act were also less satisfying to me, although the ideas were intriguing. Candace Mabry had the look and baton skills for "Twirler," but the mesmerizing imagery of her monologue didn't fully leap to life in her hands. "Marks" also had the germ of an interesting idea, but Stacy Vaccaro didn't make me believe it fully. Carolyn Sheppard Choe's monologue ("Scraps") was harmed by her having given the curtain speech. I would have preferred being more surprised at the voice and facial expressions of her Wizard of Oz-obsessed character. It's a choice role, but the memory of the curtain speech took some of the freshness away from it for me. The rest of the playlets get unqualified high marks from me. Margo Dietrich brings a cheery MacDonald's worldview to "French Fries." Latifah Johnson makes the most of the strong narrative in "Shasta Rue." Karen Thornton brings earthy, twangy life to "Rodeo." Linda Place milks the psycho depths of "Audition." Judith Beasley takes the somewhat sentimental storyline of "Clear Glass Marbles" and drills into true emotions at its depths. The two that will linger in my memory, though, are "Dragons" and "Handler." "Dragons" is perhaps the least clearcut of the monologues. A woman is giving birth to a child with some sort of birth defect, whom the mother refers to as a "dragon." It's a poetic monologue with an arching range of emotions and volumes, brought to vivid life in a wonderful performance by Leigh-Ann Campbell. Barbara Rudy is easily her match in "Handler," showing the feral, sly side of a backwoods woman who believes she has the true answers to life. It's an amazing, dead-on performance. Director Thom Thon has pulled exceptional performances out of his cast, and deserves high praise for that accomplishment. As for his set design, well, it's a tiny space, so not much could be done. I was pleased that sightlines were as good as they were for seats behind the first row. The most was made of a small platform that was moved for the different settings. When all the audience is on the same level as the stage proper, a small elevation can be important. That being said, I�ve enjoyed one-character plays in the past, almost as often as not. Still, I approach these productions with a slightly cynical you-better-wow-me attitude. For that reason, I gratefully accepted Carolyn Choe�s offer to light the premiere production of her Out-of-Box Theatre, Jane Martin�s �Talking With�,� a series of twelve monologues about women and performed by women. I suppose I assumed helping with the show would relieve me from actually writing about it, and publically �passing judgment� on another Barbara Rudy performance. For reasons too complicated to dive into now, I didn�t actually watch the show beginning to end, until after my task list was complete and the show had opened, so I watched it with the eyes of an actual audience member. In a nutshell, it wowed me. We meet twelve exceptional women (played by twelve exceptional actresses) who quickly pull us into their sharp-edged worlds. These are characters who have been wounded or have inflicted wounds, who embrace eccentricity as if it were a life preserver, who face adversity with a smile and joy with skepticism. They are, in fact, some of the most engaging women you�re likely to meet on this or any stage. Just to skim over the highlights, Jessica Fern Hunt as an actress, facing that dreaded �15 minutes� call while reminiscing about all the �directors-from-hell� we all like to kvetch about. Leigh-Ann Campbell is in deep labor, literally agonizing about the dragon she may be producing. Judith Beasley uses a container of �Clear Glass Marbles� to wage war with loss. Carolyn Choe is an Oz-obsessed housewife holding onto the last scraps of sanity. Barbara Rudy is a devout snake handler, praying she�ll get through life unbitten (just a warning � do NOT sit in the front row if you�re at all Ophidiophobic). Candace Mabry is a baton twirler whose skill is a religion, a drug, and a transport down the razor-blade of life. Peg Thon is a light-obsessed senior, Linda Place a bizarre auditioner, Karen Thornton a Rodeo rider, Margo Dietrich a worshipper at the Golden Arches, Latifah Johnson a finder of beauty, and Stacy Vaccaro is a wounded woman just trying to leave her mark. Atlanta actor Tom Thon has directed them with a firm grasp of variety and pace, and has conceived a series of monologues that, despite their disparate nature, seem naturally cohesive and of a whole. It�s a credit to the entire production that this does NOT feel like a day at Unifieds, as you may expect a bunch of monologues to feel. It feels like a glimpse into the lives of a group of women who, as a group, seem more comfortable hidden behind a veil of emotional defense. Before I finish, I want to say a few words about Out of Box. Carolyn Choe has designed the company to be a �gypsy� organization, with no permanent home or talent pool. �We seek out alternative-use spaces and create a production that fits that space. Beyond the �box,� we seek to work cooperatively with other groups, organizations, and people to expand the possibilities, the types and size of the productions we create.� I like the idea of finding a space, and then finding a production to fit that space � too often, start-up companies try to force a particular show into a venue for which it isn�t particularly suited. Too often, they do not even achieve �one-hit wonder� status. Starting with the venue is a good idea, one I hope will achieve fruition. �Talking With��� may be a little difficult to find � it�s being performed at the Artisan Resource Center, a cozy little arts warehouse hidden between a bowling alley and a pawnshop off Cobb Parkway in Marietta. It�s worth seeking out. Even without my own (and my wife�s) contributions to this production, it�s one I wouldn�t hesitate to recommend most enthusiastically. Just try not to get bit.